Is it really almost Febraury? I keep forgetting how much time taking care of a newborn actually takes up. But we’re finally out of that fourth trimester and yes, she is actually sleeping through the night, and that has given me (a little bit of) time to catch up on some of the many projects that have been waiting for me. And if you’re one of those who left me a comment or sent me an email, please hang in there. I’m slowly making my way back through my inbox that still has unread mail from September! The first thing I wanted to start up on was the 2017 Block-a-Month Crochet Along. And if you’re looking to join in a CAL, January and February, the beginning of the year, are great times to do it The new group for the year is here: 2017 Block-A-Month Crochet-Along, and even though I’m only sharing my squares now, I actually did make them toward the beginning of the month. The main square for the first of the crochet-along is Moody Blues by Helen Shrimpton, and can be found free on her website. Link to the Ravelry project page is here. This square is full of interesting textures and stitches, so it was a lot of fun to make. This was made exclusively for the bamcal, and that’s exciting. There’s so much inspiration to be found when a bunch of creative types come together for all sorts of variations on one pattern, and it’s so much fun to see what each person comes up with. 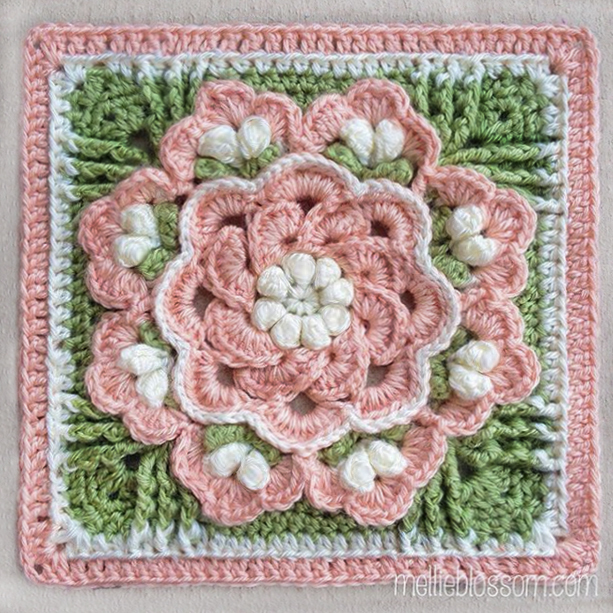 The filler square is the one that is voted on by the crocheters, and the winner for the first month of 2017 is the Kaleidoscope Crochet Square by Julie King of Gleeful Things. 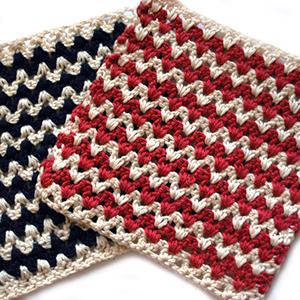 The pattern is free and comes with very detailed instructions and photos for new crocheters, and it can be found by clicking on this link here. If you want to add the project to your Ravelry queue, the link for the pattern page is here. I had fun making this one. I love the green yarn that I’m working with for this year’s 2017 crochet along. It’s chartreuse from Caron’s Simply Soft line. It’s one of my favorite colors. They don’t seem to sell it in stores around here, so when I put in my last order for Joann’s online, I threw in a couple of CSS colors that I don’t see often locally. And then I fell in love with it! The same goes for the yellow color, which is actually gold. And the addition of the orange in the color scheme really made it pop. I’m enjoying working with this set of colors. Finally, the Efflorescent Window crochet square by Delphis is another square that I made a long while back. But it was fun to make it again years later with different colors and (dare I say it), more and better knowledge of what I’m doing crochet-wise. The pattern can be found as a free Ravelry download by clicking here. This was a block in the 2013 Block-a-Month crochet along (which was my second year doing this – wow, can’t believe I’m going on 5 years of bamcals!). I never finished that bamcal, but I recently pulled out all those old blocks and printed up the patterns, so it definitely is a goal in the next year or so to get that one together. I so love the color scheme on that one. And funny enough, there are a couple of colors in there that I’m using for this year too, such as the off-white, and the brown. The yellow is a bit lighter, but still the same tone. I suppose I know what colors I like using! That was the year that I went a little crazy with borders. No regrets, it was a great learning experience, but wow did it ever take a lot of time. My version below has the petal looking border repeating with some extending rows beyond that. Pretty! But lately I’ve been enjoying more simplicity in patterns, and I think that shows in the 2017 crochet along. In the meantime, stop by the bamcal 2017 crochet along group on Wednesday to see what the crochet square selections are going to be for February (they’re usually heart and Valentine related!). I certainly will be!